Publisher: Wiley & Sons, Inc.
Did you know that accidental injury is among the top ten leading causes of death in every age group? With this book as your guide, you'll learn how to help your organization develop, implement, and sustain Safety Culture Excellence, vital for the protection of and improvement in the quality of life for everyone who works there. STEPS to Safety Culture Excellence is based on the authors' firsthand experience working with international organizations in every major industry that have successfully developed and implemented ongoing cultures of safety excellence. Whether your organization is a small regional firm or a large multinational corporation, you'll find that the STEPS process enables you to instill Safety Culture Excellence within your organization. Although this book is dedicated to safety, the tested and proven STEPS process can be used to promote excellence in any aspect of operational performance. By optimizing the safety culture in your organization, you will give the people you work with the skills and knowledge to not only minimize the risk of an on-the-job accident, but also to lead safe, healthy lives outside of work. "Breaks down the process to set up your own safety culture excellence. I bought this to learn more about ProAct system of safety culture excellence. Once I'd finished reading it I bought 15 more copies and distributed them to my entire staff so we could all get on board with this idea. We are using the books to work through our journey towards excellence." "A Must Have for Safety Strategy Development. This book provides a tremendous framework for developing your safety strategy. Quit chasing injuries and start your journey to excellence. This book tackles all areas of strategy development from creating a vision to determining metrics. A must have for any safety professional." Star Chart "I would propose that the term "roadmap" may be too limiting. A map guides you to places that others have been to before. This book/process sets the course to achieve results not seen before. I am using this book, as well as the ProAct DVD "90 Minutes to Safety Culture Excellence", to help guide my company's Leadership Team to develop the approach for a newly formed company. The modular approach breaks it into manageable pieces that keep a room of Type A personalities engaged. Thanks to Terry and Shawn"
"Good book. Great content. Full of useful things. I hate reviews. On Amazon you can look into the pages and decide for yourself." "Just maybe my new favourite Book to share with others." "I wanted to express my appreciation to Pro Act Safety and Shawn Galloway, in particular, for his participation in our Annual Leadership Safety Conference. Shawn is an excellent speaker, and he really connected with the audience. I received numerous comments from our leaders about the positive message and in-depth insight he provided involving their role in safety culture. I can confidently say that everyone walked away from the conference with ideas about how they could improve their engagement with employees and help drive significant improvements in safety performance. Having read the book "Steps to Safety Culture Excellence" I looked forward to the additional thoughts Shawn would provide at the conference. Shawn did more than deliver; he left a lasting impression that has our organization eager to raise the bar! I would encourage any organization looking to advance their safety culture to reach out to Pro Act Safety. On behalf of my safety team and our company, thank you Shawn." "Awesome book! Great insight on human behavior transcending beyond the workplace." "Great book. We bought this for our leadership team to read. After reading it there were many questions that we had to ask of ourselves about our already Good Safety Program and Culture. Highly recommend getting this book if you want ways to improve your Safety Program and Culture." "'Roadmap' is the Right Description 'STEPS' is an excellent roadmap for building upon the culture already present in our workplace. I'll be using it to improve where we are going with our business' safety program. This roadmap -- from developing a strategy (most of us don't have one) to selling the strategy to how we do or don't utilize discipline is presented in an easy to follow format. Love the lists of questions to be answered at the end of each STEP. We'll be getting started on our first STEP in the next few weeks." Challenges Traditional Thinking "I would highly recommend this book to anyone who leads safety or people in general. This is a step by step road map to develop and continuously improve your existing culture to excellence. I found myself reading the STEPS over and over again. This book is rich in information that is results-oriented and extremely practical to start in your organization today. I find myself referring back to this book on a regular basis. Terry and Shawn are truly leading the safety industry to excellence and consistently challenge the status quo of traditional thinking"
"Whether you are running a safety program or simply looking for leadership principles that can change a culture, this book is a MUST HAVE! "The perfect ending of every journey is not where it takes you, but what it makes you" (Mathis & Galloway, 2013, p.ix). If you have a leadership team I recommend reading this book along with your team, to foster a culture of excellence!" "Recommend Steps to Safety Culture Excellence to safety professionals and managers in the work place. Easy read to follow for improving the safety culture in your company and personal outlook." "As a ProAct Safety follower I was really looking forward to a book that could put all of what our Plant has learned in to a step-by-step guide to keep our journey towards safety culture excellence moving forward. This book is all of that, and more. 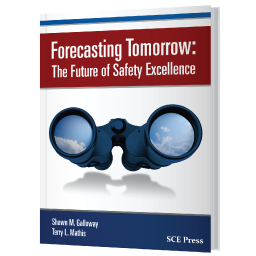 Shawn and Terry's knowledge, shared experiences and passion for safety makes this book a must read for any organization. Each milestone (STEP) in the book does just what I want a book to achieve, attain more knowledge, further my passion for safety, but more important, being able to apply the learnings in to your organization. Our Plant is implementing and adjusting some of our STEPS." Excellent book with clear and tangible information - MUST READ for any safety professional! "This book is a true must read for any safety professional who is or is trying to bring about a shift in their safety "culture" approach. Currently, I have read through this twice - as much as we feel, as safety professionals, that we get it - Terry and Shawn continue to show us (me?) that there are many things we take for granted and shouldn't. The book illustrates clearly and profoundly the importance of having a "TRUE" safety strategy, one that is not just communicated, but EFFECTIVELY communicated at all levels throughout the organization. Although all the STEPs may not apply to everyone, I found that I took something positive away from each one although some more than others. I challenged my management team with the questions in each of the STEPs and found that some have quite different interpretations than that of the main senior managment team - which leads to less clear expectations to those reporting up to those management members. As a senior safety professional in a senior role in my company I recommend ALL of you look at having everyone who are leading others in your pursuits to safety excellence read this book and participate in the questions and exercises. To me, those make the whole book - it is tangible and reflective of how well the message has been previously communicated and how to move forward with the message and the strategy decided upon. As always, Shawn and Terry, you continue to make me stronger and more educated everytime we have some form of contact or communication. Thank you for saying what it is so clearly that even I can comprehend it!"